Sadly, coconut palms will not grow in our Zone. Nor will most other palms found around the world. So what’s a palm lover to do? 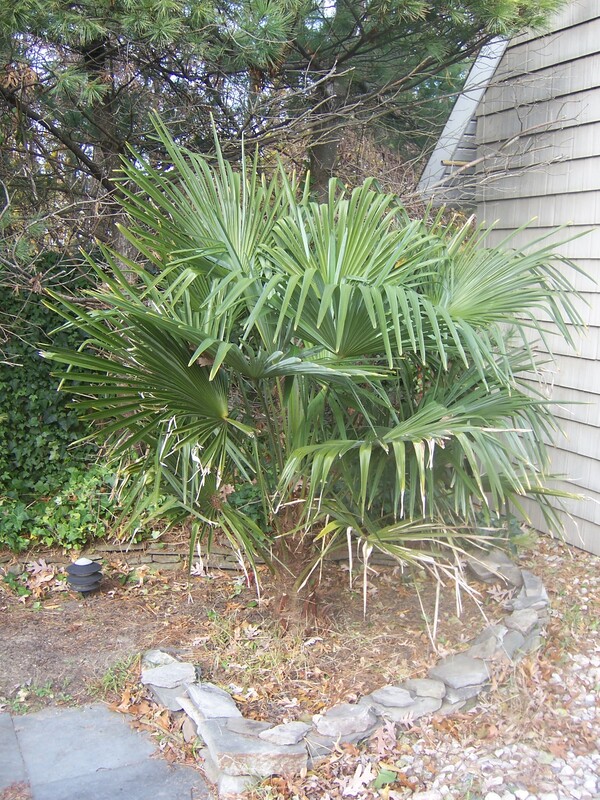 About 7 years ago, we purchased a windmill palm, Trachycarpus fortunei to be exact, from Stokes Tropicals. Originally grown in China, the windmill is one of the hardiest of palms, able to tolerate a fairly severe freeze and a light winter snow cover. But this is Long Island, and winters are unpredictable. Sometimes mild, but in recent years — cold, snowy, and frozen. Although the palm receives full sun, there are steps that we must take — or rather Joe must take, with my assistance — to ensure winter survival. Hello Traveller. Well, if I had my way, global warming would turn my Northeast garden into a tropical wonderland. Until then, it’s wrapping time. Thanks for visiting — and enjoy those coconut palms! Incredible! What an interesting technique. I don’t believe I’ve ever seen anyone do this before. Very enlightening- thanks for sharing. Mario, this technique has taken some time. We’ve tried wrapping other tropicals, and we’ve tried straw — but this type of palm and the leaves (which we have plenty of) seems to work best. In a few months, I’ll show the unwrapping. 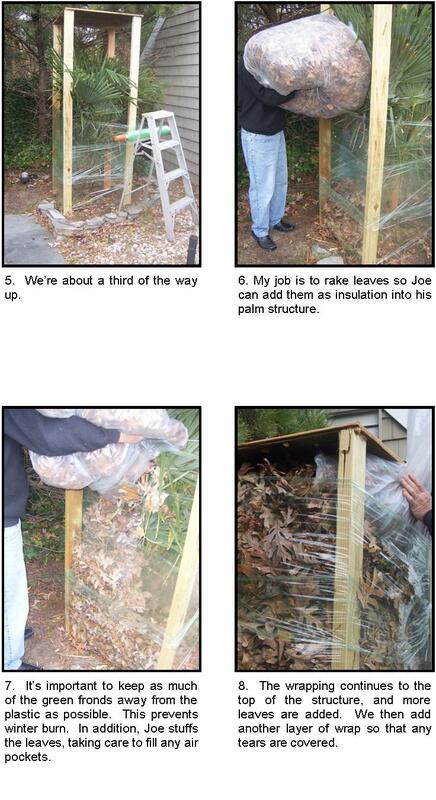 What a lot of work you have to do to protect your plants and trees from the freeze. If you want the tropics and you’re out of your zone (and some might say out of your mind), wrapping is the thing to do. I really should have put the time it took to do this. At this point, after years of practice, we can do this in an hour. I hope the palms don’t think you take them for granted. They’re kind of touchy about that. Glad you liked the post. I’ve seen this technique used for Banana Palms here in the UK, most memorably at Great Dixter. Thank you. We’ve tried to do this with one of the hardier banana trees, but all we had in the spring was a bunch of mush. So far so good with this type of palm. So glad you enjoyed the post! Kevin, I so enjoyed this article. I love palms as well and, alas, garden in zone-5. 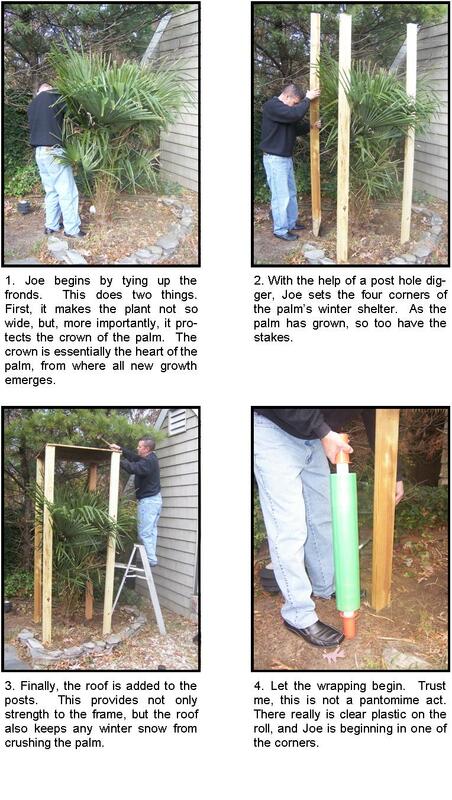 I have never seen this done; 7-years and still alive and healthy is a true testament to Joes love for palms and his tenacity. Your structure looks fabulous! So much work – it truly must be love! Great article Kevin. You guys go to great lengths to protect that palm and it’s good to see that you found a good use for your leaves. Living in California, growing most palms doesn’t require anywhere near that amount of care for me. In fact, my neighbor has a huge palm tree that I very openly wish would succumb to a cold winter because it is forever dropping seeds that sprout everywhere. Chad, good thing those seeds aren’t coconuts. They hurt. If I were you, I would collect those sprouting palms, nurture them along, and then sell them — a small nursery business. It is true, though, so plants can become overwhelming. Hang in there. wow, what a great team you two make. That palm looks incredibly cozy and what a well put together structure is has. Great job. Thanks — we’ve had years of practice. And the palm is worth the effort. Thanks! This was a bright spot at the end of a very long day! Maria, glad you found some comfort in a covered palm. Be well. Very nice. The structure is, uh, hardly noticeable.. The things we do for the plants we love! I don’t think I would ever go to that much trouble to protect any plant, but I admire those who do. I have a low maintenance, survival of the fittest attitude to gardening. I smiled when you said low maintenance. It seems like every year I give myself a talk that this will be my low-maintenance year — and each year, that thought is quickly thrown out the window. I certainly appreciate your Darwinian approach. 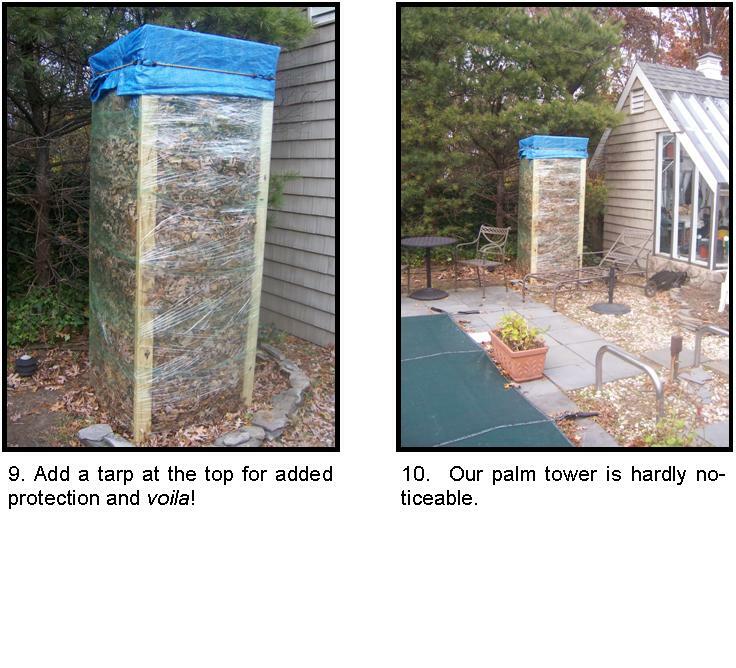 I think this post makes our efforts at wrapping tree ferns look rather feeble. That palm wouldn’t dare up and die after all that tlc, would it? Impressive job. Thank you. It is definitely snug in there — and the unwrapping is always an exciting part of spring. Did it live? How did it hold up? Did any fronds turn brown? Fortunately, it’s tough little palm. Thank you for commenting. Enjoy the day.